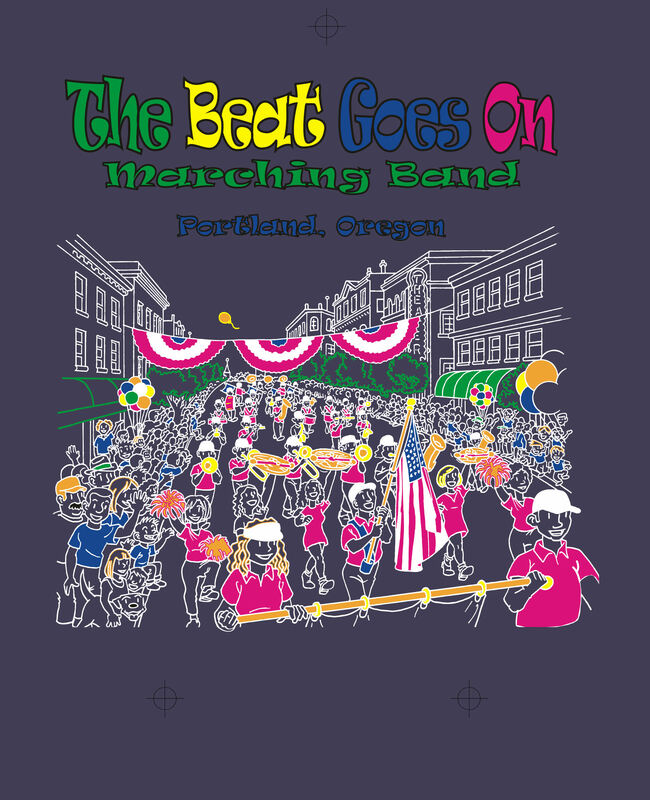 The Beat Goes On is an international award-winning all-adult marching band committed to delighting Northwest, National, and International audiences while reliving the best parts of the marching band experiences we fondly remember and creating indelible memories. 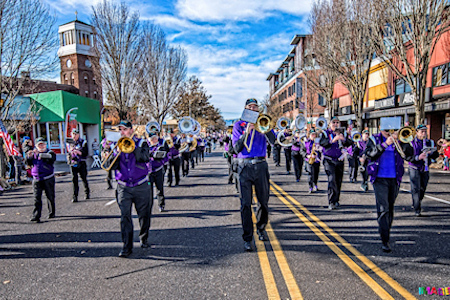 The band has performed at a 25 mile floral parade in the Netherlands, alongside Plymouth Rock and the Mayflower, on the floor of the Oregon House of Representatives, aboard a Caribbean cruise ship, in the courtyard of an 18th century castle, atop the Great Wall of China — and at hundreds of civic, corporate, and private events across the Pacific Northwest. Founded in October 2011, the band is renowned for its upbeat attitude, feel-good musical selections, and emphasis on audience interaction. 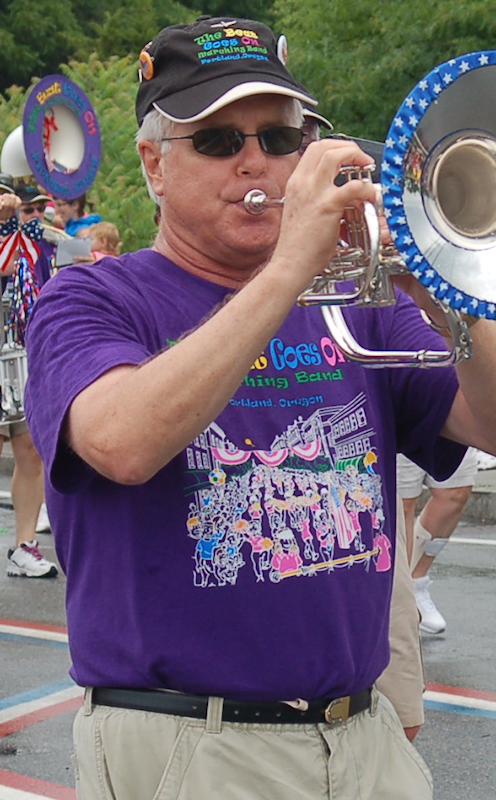 Though its musical tastes are eclectic, TBGO features a high-energy, brassy, rock and roll style â€“ we may be a marching band, but we're more likely to play Bruno Mars than John Philip Sousa! If you can't find info on this page that was announced in email, try refreshing the page in your browser (Ctrl-R or Ctrl-Shift-R). 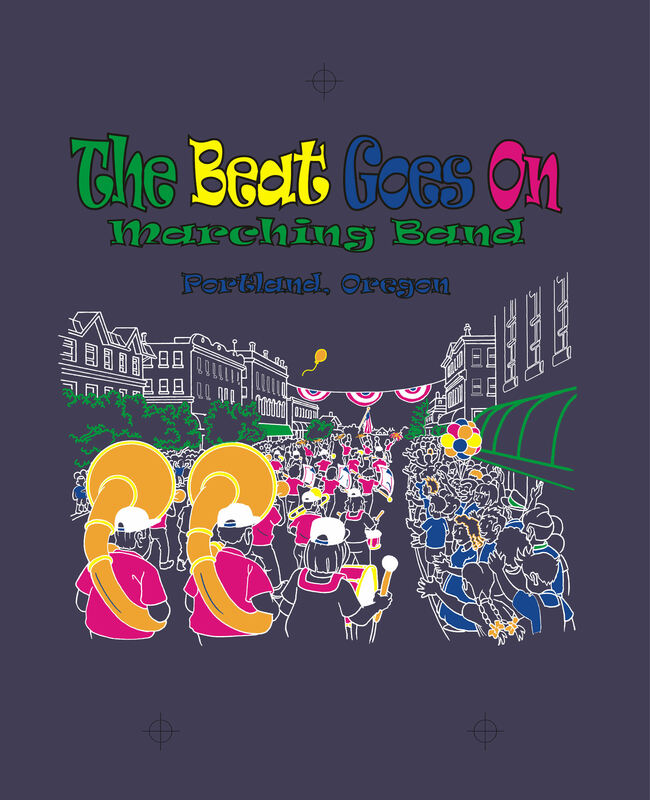 Beginning with the 2017 season, we have RETIRED the TBGO t-shirts (with the cartoon of band on front and back) -- the t-shirt will no longer be used as part of the official uniform. The t-shirt is still available for purchase and is great to wear around town, on road trips, etc. It's still a cool shirt!!! We are now using the dress polo shirt at all events. 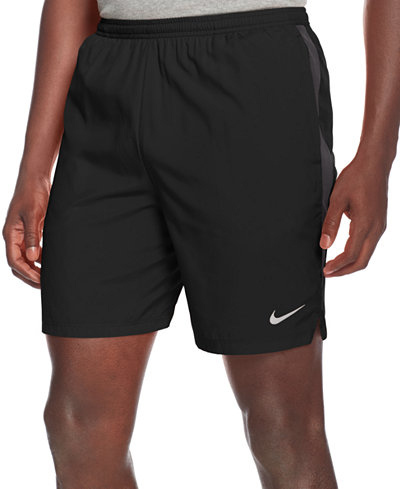 We have CHANGED the color of shorts and shoes at informal events. Beginning with the 2017 season, we are going to black shorts, white shoes/socks for informal events. Finally, we have REMOVED ALL PURPLE FROM FOOTWEAR. 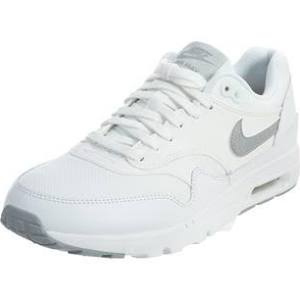 Shoes are black (dress) or white (informal) -- no purple shoes, no purple laces. 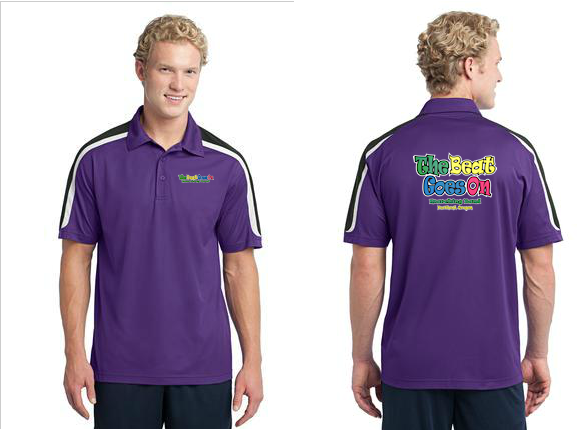 Official TBGO logo dress polo shirt. See below for info about tucked/untucked shirts. For specifically designated cold weather events, the optional Official TBGO Winter Jacket is highly recommended. 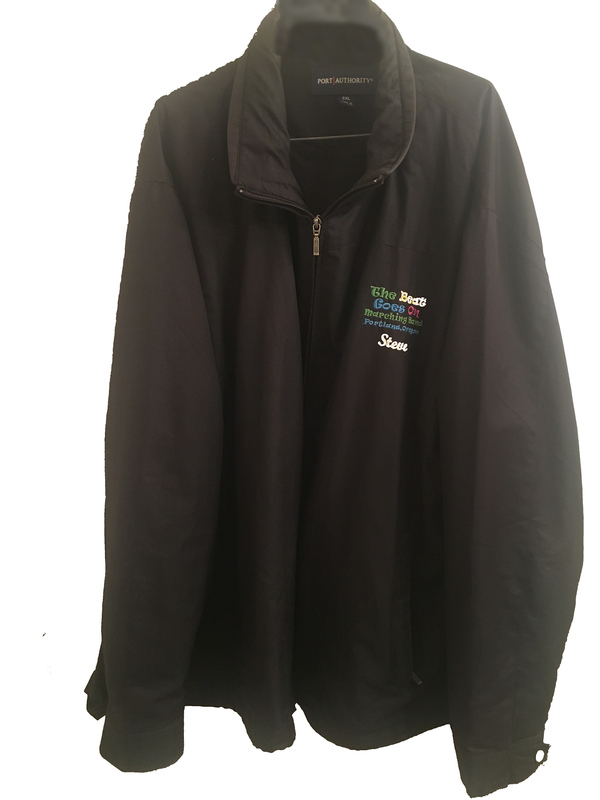 For specifically designated cool weather events, the optional Official TBGO Lightweight Black Jacket or other solid black non-logoed jacket may be worn. In general, your uniform shirt may be worn tucked in or untucked (we do not have an official policy at this time). Untucked shirts protruding from the band of a jacket make us look sloppy and unkempt. IF YOU ARE WEARING A JACKET (either the winter jacket or lighweight black jacket), SHIRT MUST BE TUCKED IN. Whether or not you are wearing a jacket, if you are wearing a fanny pack we request that you wear the shirt TUCKED IN since that greatly improves the apearance of the band. See the Payments page for current pricing of all uniform parts. Uniform parts are available ONLY to TBGO Band Associates. To check availability of sizes and order uniform parts, contact janet AT tbgo.org. Once you have placed an order, click this link for the TBGO Payments page to pay for your order by credit card or check/cash. 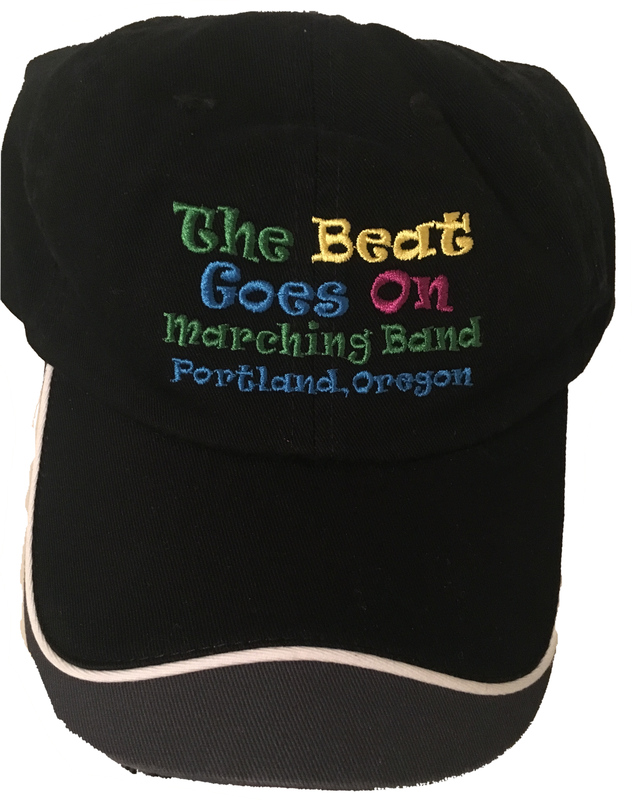 The current Official TBGO Hat is a black baseball cap with dark gray / stone accent on the bill and full-color embroidered band logo. Hats are single-size and are generally available for order at any time. Contact janet AT tbgo.org to order a hat. As of January 2017: This is the ONLY official TBGO uniform shirt. It's called the dress polo, but is used with both the dress and informal uniforms. The dress polo shirt uses a micropique fabric that is lighter and more breathable. 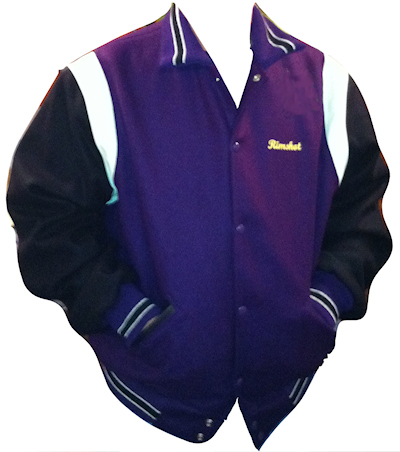 The three-color sleeves mimic the look of the Official TBGO Letterman Jackets. Both ladies and men's styles are available. There's a small TBGO logo on the front and a larger one on the back as shown. Logos are a press-on decal (not embroidery or screen printing) because of the way printing works on this shirt fabric. Sizing tables for the shirts are given below. All band associates need to obtain this shirt. 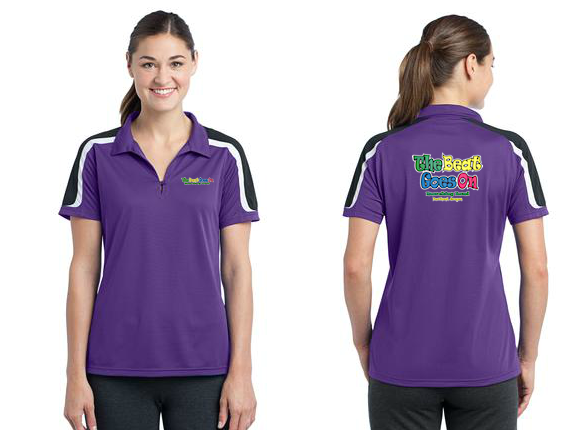 Contact janet AT tbgo.org to order a dress polo shirt. Sport-Tek® Ladies Tricolor Shoulder Micropique Sport-Wick® Polo. LST658. Three colors on the shoulders. Smooth, snag-resistant and breathable. Sport-Tek® Tricolor Shoulder Micropique Sport-Wick® Polo. ST658. Note: Ladies may order the Men's shirt style if they so prefer. TRUE BLACK - no charcoal, darkish gray, navy, etc. FULL-LENGTH PANTS ONLY: no calf-length crops, Capri pants, etc. If you have to ask whether a given pair of pants is okay -- they're probably not okay. Don't make use tell you "no". Think chinos or nicer and you'll be in the right mental space. Remember that this is a UNIFORM part, which means THE GOAL IS TO LOOK LIKE EVERYONE ELSE. 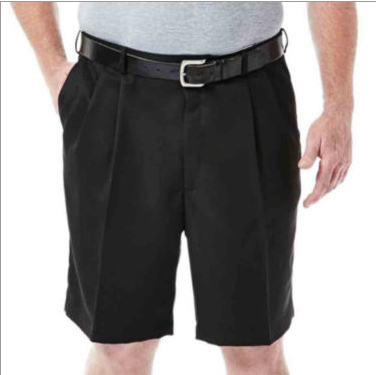 NO SHORTS BELOW THE KNEE - no calf-length crops, Capri pants, extra-long shorts, etc. 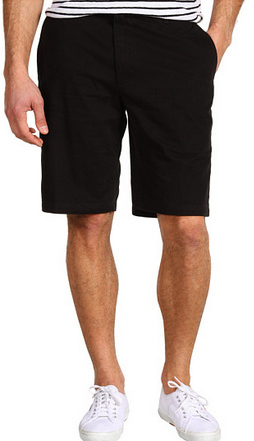 If you have to ask whether a given pair of shorts is okay -- they're probably not okay. Don't make use tell you "no". Again, think chinos or similar and you'll be in the right mental space. Remember that this is a UNIFORM part, which means THE GOAL IS TO LOOK LIKE EVERYONE ELSE. Here are some examples to help maintain a bit more uniformity in our look. Select styles that look "more like these" and avoid those that are marked "not like these". NO - cargo pockets, too busy! Getting the right fit with shoes can be difficult, so TBGO does NOT have a single official type of shoe; members should choose comfortable shoes of the appropriate colors: black shoes and socks for the Dress Uniform, white shoes and socks for the Informal Uniform. 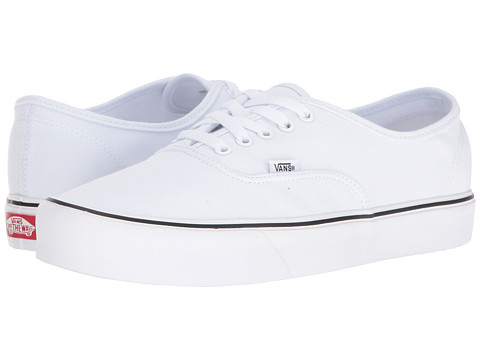 Shoelaces must match the shoe color (white laces with white shoes, black laces with black shoes). Remember that this is a UNIFORM part, which means THE GOAL IS TO LOOK LIKE EVERYONE ELSE. If you have to ask whether a given pair of shoes is okay -- they're probably not okay. Don't make use tell you "no". Black shoes: Black shoes must be all black and closed-toe (no sandals). Rubber-soled walking shoes are recommended. 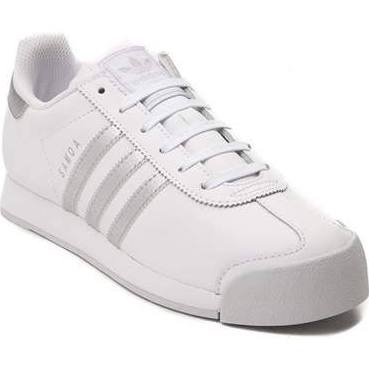 Canvas tennis shoes (e.g., Chuck Taylor All-Stars or similar) are not acceptable. 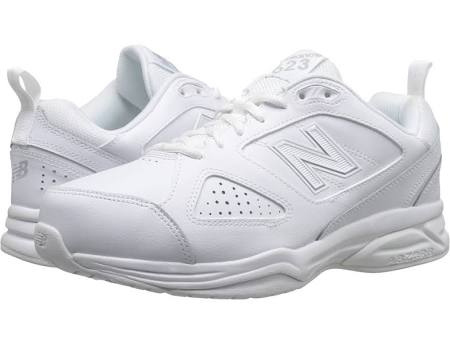 White shoes: White shoes must be all white (minimal color on shoe logo is acceptable) and closed-toe (no sandals). 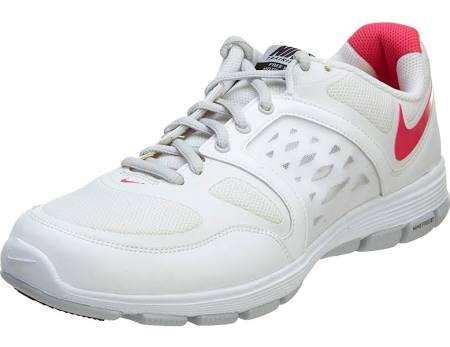 Rubber-soled walking shoes or sneakers are recommended. 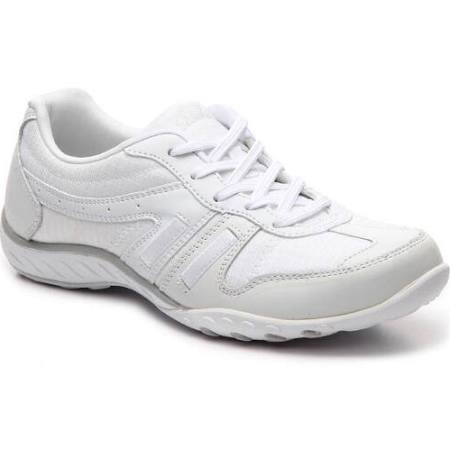 Canvas tennis shoes are not acceptable. Purple shoes: Purple shoes are NO LONGER PERMITTED with any TBGO uniform. Laces: Purple laces are NO LONGER PERMITTED with any TBGO uniform. 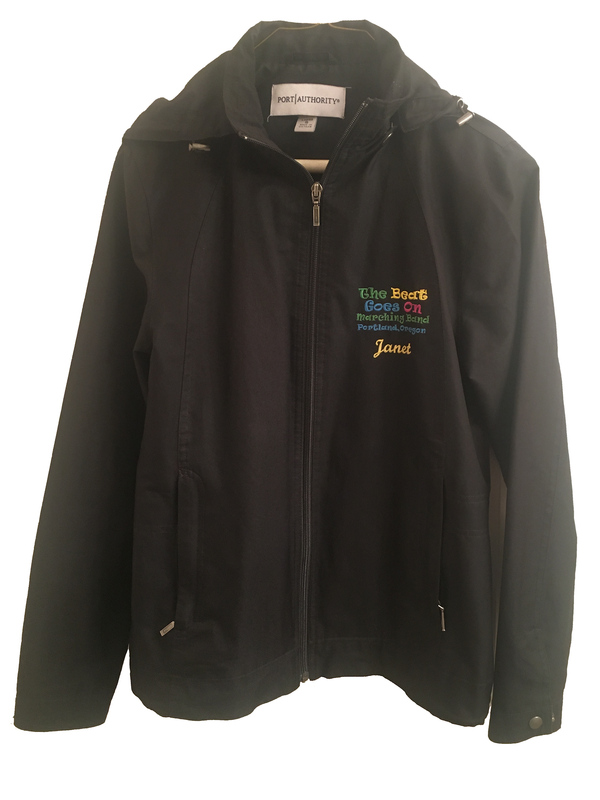 The Official TBGO Winter Jacket is worn by band members in "the block", but is not worn by auxiliaries (twirlers, dancers, color guard) - auxiliaries have their own complementary Dress gear. Auxiliary members may optionally purchase the jacket for travel or other use. Body of the jacket is 24 oz. Pendleton wool in purple. Sleeves are 24 oz. Pendleton wool in black. The sleeve gusset (light-colored band) is champagne-colored leather. Color, sleeves, and waistband are matching striped knit as shown. Full color logo appears on back of the jacket as shown, with your name or nickname optionally embroidered in script on the front. Jackets are NOT kept in stock by the band since each is built for a specific individual. A jacket ordering window is opened once each year. 2018 WINTER JACKET ORDERS are now open. Orders must be placed by 11:59 pm on Thursday August 23, 2018. This is your ONLY opportunity to order a jacket in 2018. After orders close, your next opportunity will be August 2019. Please note that you must complete payment for your jacket BEFORE we place the final order with our supplier or your order will be cancelled. The Official TBGO Lightweight Black Jacket is worn by band members in "the block" and some auxiliaries; contact your unit captain to see whether they are used by your auxiliary unit. Other auxiliary members may optionally purchase the jacket for travel or other use. Jackets are 100% polyester. Women's jacket has a more tailored look and includes snap-off hood. Men's jacket has hood that rolls inside collar. 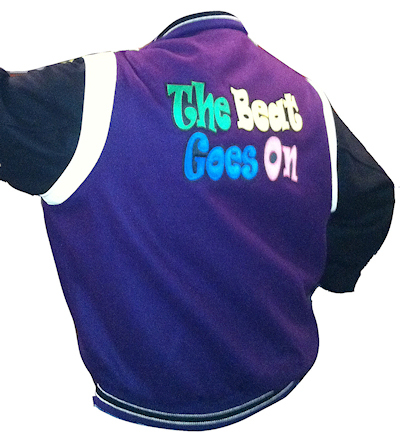 Full color logo appears on back of the jacket as shown, with your name or nickname optionally embroidered in script on the front. Jackets are NOT kept in stock by the band since each is ordered for a specific individual. A jacket ordering window is opened once each year. 2019 LIGHTWEIGHT JACKET ORDERS are open through March 24, 2019. Contact janet@tbgo.org to place your order. Next ordering window is March 2020. For those who like to use a waist pouch to hold their gear during events, an OPTIONAL fanny pack with TBGO logo is available for purchase. 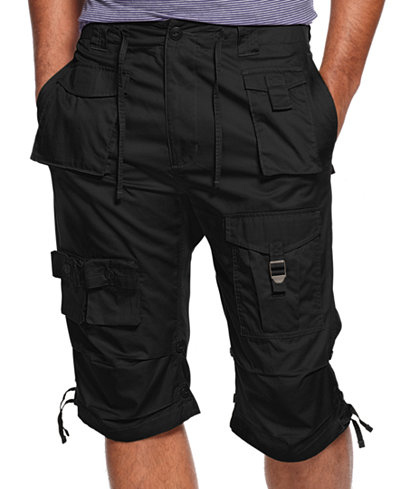 The fanny pack is made of 600 denier black polyester canvas. It is approximately 10" wide, 7" tall, and about 3.5" wide when fully expanded. Three outside zippered pockets, two inside pockets. One inside pocket is configured to hold tickets, keys, passport, etc. The outside flap (with the logo on it) flips up from its velcro fastener to reveal one of the pockets. The pack is large enough to hold a standard music flip folder plus the rest of your TBGO music. The side mesh water bottle pocket holds a half-liter bottle with ease (and actually holds my larger water bottle just fine). Click photos to enlarge. The first one (shot with flash) shows better detail on the bag. The second photo (no flash) gives you a better idea of the actual color of the logo (TBGO blue). The TBGO Logo T-Shirt is a high-quality unisex T-shirt in TBGO purple. 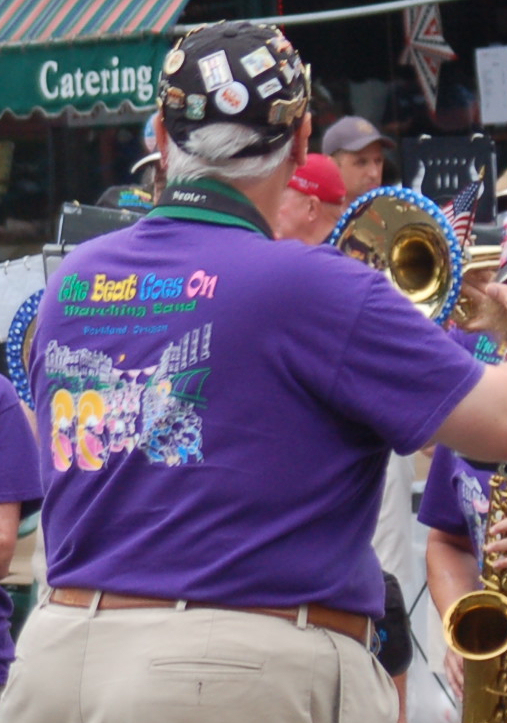 The TBGO logo and full-color "parade" graphic are screened onto front and back of shirt as shown. Click designs or shirt photos to see enlarged view. OK gang, you've all bought a T-shirt before, so let's not make a big production out of this! We purchase high-quality shirts, so expect minimal (1/2"?) shrinkage. For the absurdly curious and chronic worriers among you, here's sizing info. Black turtleneck is an OPTIONAL part of the uniform; it gives you something to wear under the polo shirt for additional warmth in cold weather events and parades. In earlier years, we offered a black turtleneck with TBGO logo; however, TBGO-logoed turtlenecks are no longer available. If you still own a logoed turtleneck you may wear it; otherwise, wear any plain black turtleneck.